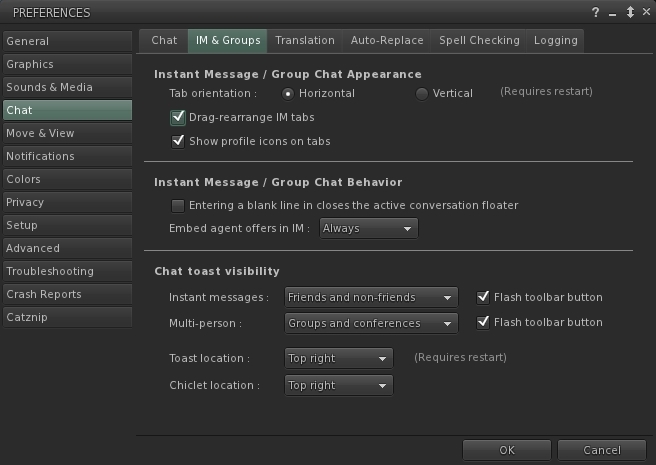 A completely new tab and panel in Preferences is the Troubleshooting tab. 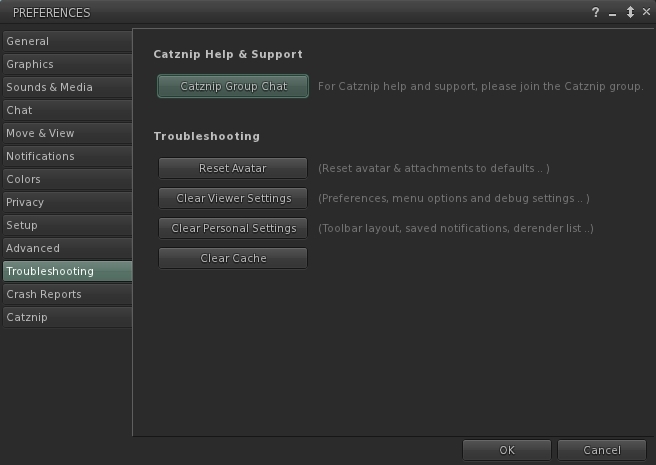 This is aimed at helping users resolve common problems by bringing together a number of viewer options, together with an option to join the Catznip in-world group, where further assistance can be obtained. 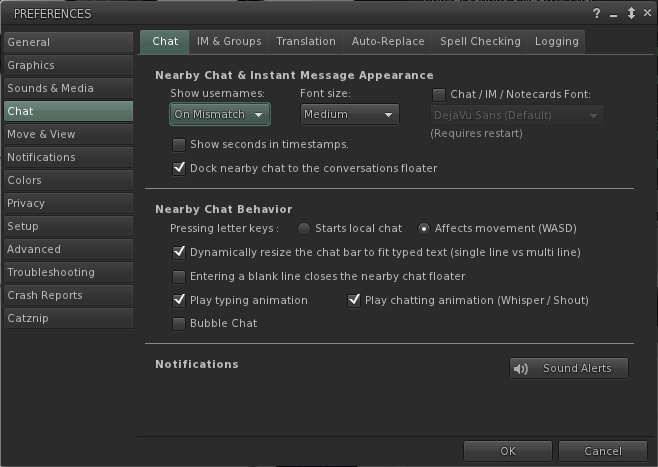 Future updates of Catznip will see further revisions to Preferences, including the eventual removal of the Catznip tab, as the options there are gradually relocated to other tabs and elsewhere in the viewer (as with the Chat sub-tab, mentioned earlier in this article). Catznip’s profile floater has been revised. 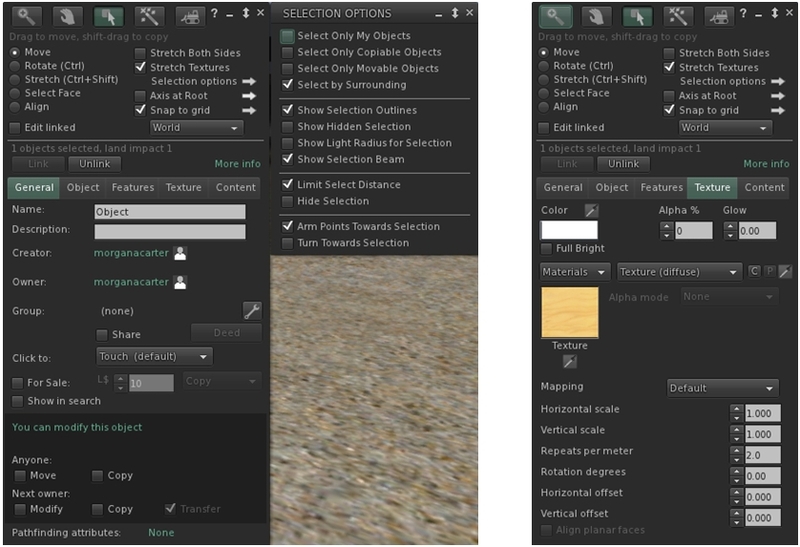 The top section of the Profile panel now includes a Copy to Clipboard button which, which clicked, displays a drop-down menu of copy options (full name, display name, user name, SLurl and UUID). Options at the bottom of the Profile panel has been replaced with gear icon button (consistent with other panels and floaters), which contains the Remove Friend, Show on Map (if mapping has been enabled by the user in question), Share and Block options. 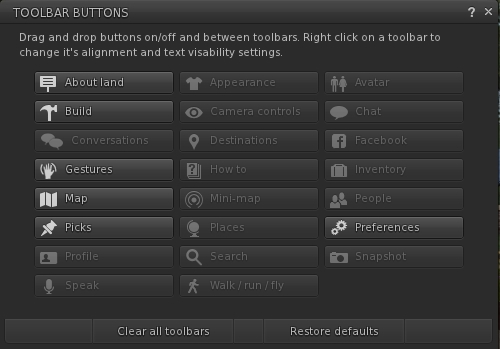 The toolbar button floater has been revamped and tidied to present a fresh look. The Avatar Picker (e.g. 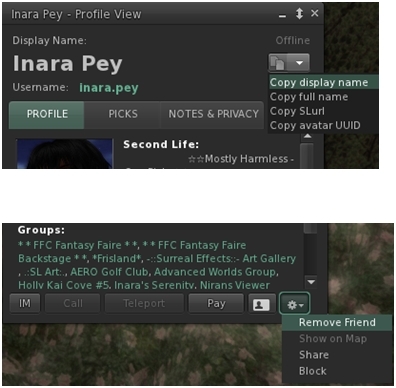 the floater displayed when you click the + at the bottom of the Friends tab of the People floater, for example) has been updated by popular request such that the Friends tab on it now includes user names, and names on the tab can be filtered. Bug fixes from both the Catnip team and LL. A huge update in many respects, including not only support for LL-driven features, but also a boatload of nips, tucks tweaks, fixes and so on as well as many UI and other updates and improvements. Performance-wise Catznip R9 is as slick and fast on my primary SL PC (My Bits > Review Systems & Settings from the menu at the top of this blog) with FPS staying comfortably in the upper double-figure ranges, even when visiting a particularly busy sandbox with my Crash Test Alt. 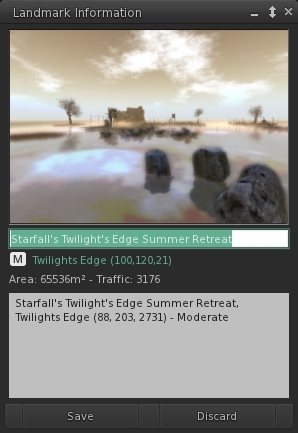 The Catznip team have worked hard on this viewer over the years, and there are some innovative features which really set it apart from other TPVs, and it’s easy to see why Catznip’s star is in the ascendant (3rd most popular viewer by user numbers, I’m informed). Catznip R9 raises the bar again, and it’s hard to see this release disappointing any regular Catznip users – but easy to see it winning more among those who may not have given it a go in the past (and if you’re looking for a new v3-style viewer as your primary viewer for whatever reason, I cannot recommend it strongly enough). From this point forward, future Catznip updates are liable to be smaller and appear faster. Given the way the Lab has been churning out features and option for the viewer of late (even allowing for the current lull in things – a chance also for TPVs to catch up a little more / catch their breath), and the new shorter cycle with more tightly packaged updates will hopefully see Catznip keep more on a par with LL viewer updates in the future. It doesn’t count as a release until there’s source code. Sorry that yet again we have failed to put the needs of a handful of viewer devs unrelated to our project ahead of everyone else, I see this trend continuing. We always have and always will release our source code as required under the terms of the LGPL. Why do we have to harrass you about source code every time? No other SL viewer does this and all serious opensource projects i know release code together with their binaries, anything else would just look unprofessional or plain shady. You act like it would take hours of work to push code to bitbucket when it is only a few clicks. What’s the deal? i’ll correct myself, you even pushed it to BB already but set it to private for some reason: https://bitbucket.org/Kitty_Barnett/catznip-r9 … so clicking one checkbox to make it public is too much work because your users are more important than the GPL and TPVP ? Does it add the upload direct to Flickr on the snaphot window? The Flickr upload has not been added to the Catznip snapshot floater. 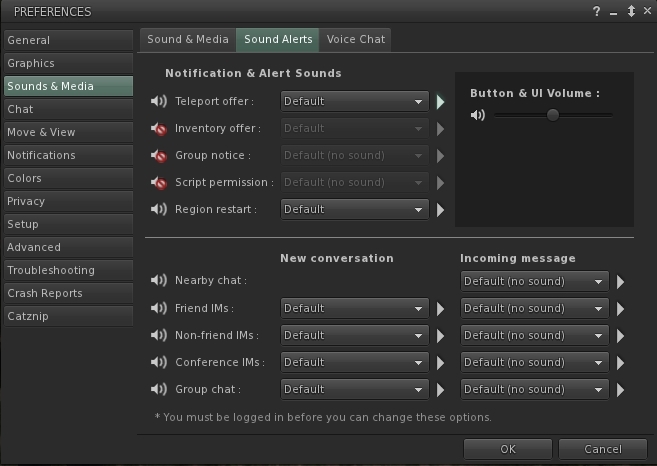 This may well become redundant in TPVs as the SL Share 2 code is adopted.